'It's Art' is an online community that offers inspiration for CG Artists. 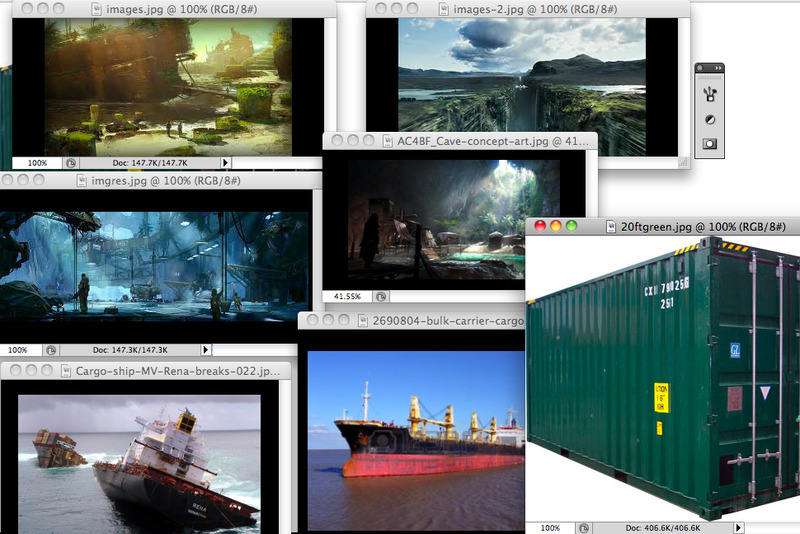 This includes 2D concept art, and there are many instances where 'It's Art' is involved with the online art community. One strong example is it's involvement with the 'Daily Spitpaint' group, where at the end of each month the administrators pick a selection of their favoutrite 30 minute speed paints. I decided to submit one of my pieces into the monthly 'It's Art February Awards.' These awards are new, and are to be held every month. There is no subject, and participants are allowed to submit any original artwork that has been created in the current month. 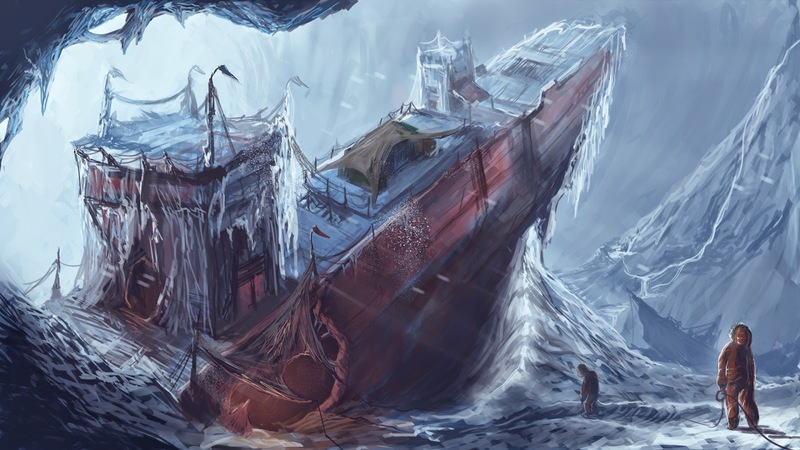 I chose to submit a personal piece I had created depicting a mysterious shipping vessel in the middle of an Ice cave titled "Frostbite." I started very loose with a monochrome blue feel. Instead of bringing in a warm complementary orange, I opted for a cooler brownish red to maintain to chilling feel, yet offer some contrast with the very cool blues. 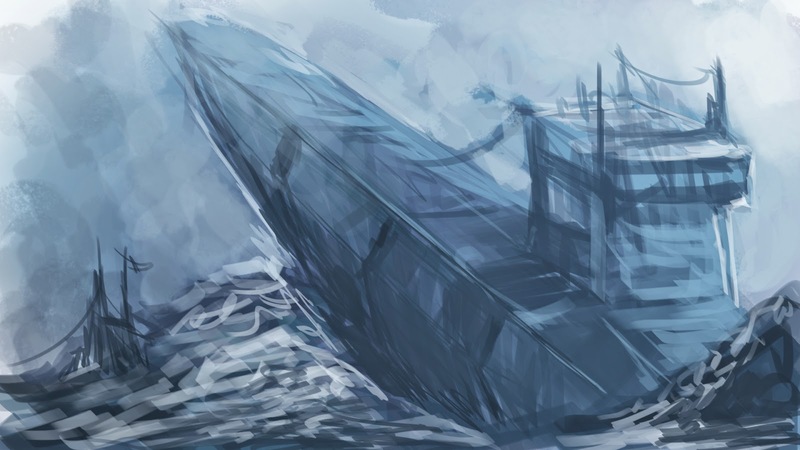 Here I am beginning to render in details like the damaged hull and covered shipping crates on the deck. I feel this is an area I have improved on massively this year. Notice how I quickly captured the bold shapes and values that make up the composition before rendering out the intricate parts. This means that I am working much more fast and efficiently. With the final rendering, I painted in areas of orange. The warmness and heightened saturation help draw the eyes into interesting parts of the composition. The explorers in orange snow coats create a sense of scale as they descend down a worn in path. 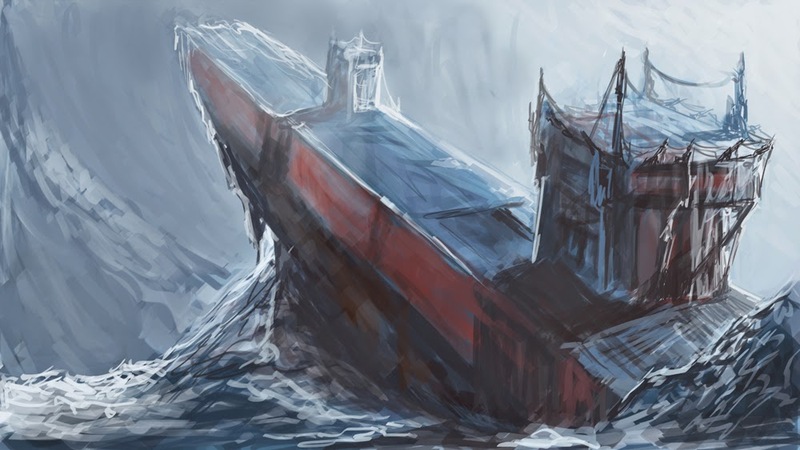 This trail draws into the damaged hull, where an orange light burns hinting that someone has taken shelter in the ship. It follows a rule that there are areas of the painting that spark the viewers imagination and suggest activity. 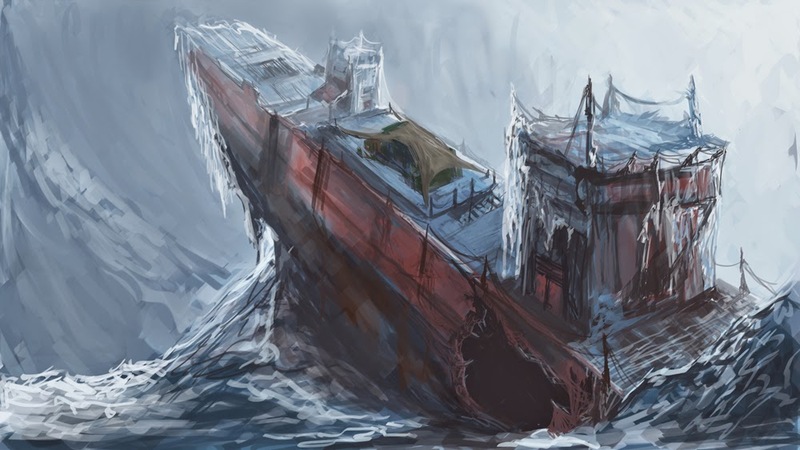 Are the explorers returning to the shelter of the ship where their friends have built a fire, or have they just stumbled across the ship and are preparing to make contact with whoever has inhabited the wreckage? My work successfully submitted for consideration. In the end my piece received what I feel was a respectable 6 votes.